I skipped the gym on Sunday. It was my last day of having the place to myself and I wanted to make the most of it! I had a session with Pete on Monday morning. 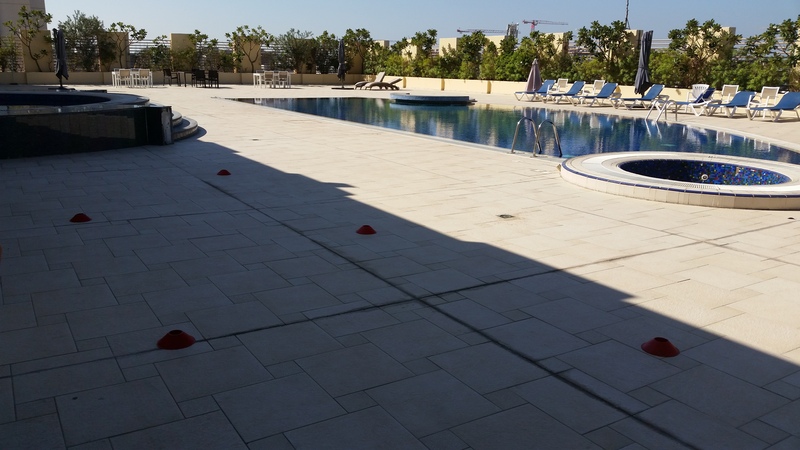 We had our session at the pool again as the gym is still being renovated. They’ve laid the wooden floor down and painted the walls. I hope they upgrade the machines as well though. My warmup consisted of jogging around the pool five times. Honestly, I didn’t think I’d be able to do it without stopping every now and then, but I managed it. I think I was going really slowly though! 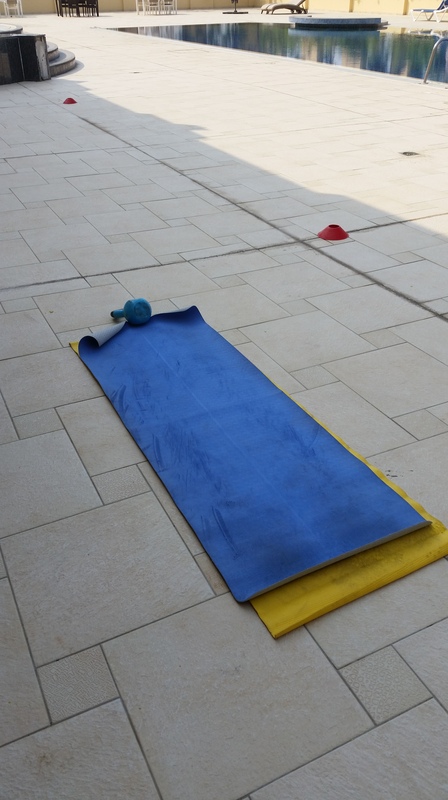 We set up the mat, shuttle markers and kettlebell in the shade. In the first set, I touched the markers 9 times. In the second set, Pete told me to go a little faster and touch them 10 times. And in the third set, he wanted me to touch them 11 times, but I went 2 s over the 30 s. The side squats were considered ‘active rest’ (which is just BS as it’s no rest at all) and I had exercise tubes around my knees to make it a bit harder. I managed to do the pushups without stopping each time, until the last set where I struggled with the last two or three. For the low row, Pete passed the exercise tubes behind his back and I had to hold the handles and pull the ends towards me. After that, I had another short break followed by an abs circuit. Pete told me we’d do two sets, possibly three, depending on how I was feeling. He told me what the exercises were and I really thought I’d be able to manage three sets. After the first set, he pulled me up and told me to walk around during the rest. Why couldn’t I just lie on the mat?? I told him it was actually harder than I thought it would be, but I still thought I could do three sets. In the second set, I did it all but struggled with the plank – and even the double crunches and situps were tough. He said I’d worked very hard in the session so I’d only do two sets. I did a few stretches after that and went home. My abs were so sore on Tuesday, and my hamstrings were a bit sore too! I woke up and struggled to get into a sitting position (pathetic, I know). I hadn’t felt this sore in a long time. I decided not to go to the gym – I had errands to run and work to finish off before travelling on Friday. I had my 20th session with Pete on Wednesday (time flies)! We stopped to look at the gym – the floor had been done and all the machines were back where they used to be. All three treadmills have new running belts, but I didn’t check out the cross-trainers. There was still a sign on the door that said the gym was out of use so we carried on outside as we had planned. At least I wouldn’t have to renew my membership at the Shangri-La when I got back – yay! Pete added some resistance by putting me in a harness of sorts. Well, not really a harness, more like a band that went around my hips that he held on to and pulled on so I’d have to keep working. It reminded me of the pool at South Fork when I visited Dallas many years ago – on the show it always looked like they were swimming furiously but in fact they were all tethered to the side of the pool and going nowhere. Also, the pool was the size of my bathroom! After the Tabata circuit, he laid out the shuttlerun discs in a zig-zag route. He said he would time me. In the first set, I did it in 45 seconds. In the second set, I managed to shorten my time by half a second! I told Pete that at least I was consistent. In the third set, I did the circuit in 43:08! And in the fourth set, I did it in 41:something (I can’t remember what it was). Oh. My. God. My abs were on fire after two rounds of that! On the plus side, at least I know I have abs somewhere deep inside me, even if I can’t see them! I did some stretches after that and we were done! It was my last session with Pete before my holiday and I wouldn’t see him again until after Christmas. Low point of the week? Just two workouts this week… and even then having such sore abs! High point of the week? Heading off on holiday! Weight loss? Still going up and down!